When it comes to lens choices, sports photography offers a seemingly endless selection of glass to choose from. The fun part about that choice is there is no wrong choice. But there are times when I can’t make up my mind which lens to choose. Rather than angst over making a decision, I make a choice and live with it. Sometimes for the best, sometimes not. Is there a right or wrong choice? I wonder sometimes when the result doesn’t come out the way I had hoped for. Many times, it’s really a crap shoot. Risk versus reward is always in play, as is considering the general nature of the assignment. There are times when I can’t afford to take on much risk, so my choice will be made for me and I usually end up selecting a conservative focal length lens. I got lucky with this frame of Alexei Ramirez in the air. Made with a 500mm f4 Nikon VR lens, this image was shot very tight. Glad everyone cooperated and stayed in the frame, which isn't always the case! Shooting loose doesn’t always equate to less risk. Actually, it can be as risky as shooting extremely tight, but when executed properly it too can come with great reward. Let’s take a look at some of the choices that come into play while shooting sports, particularly baseball. When shooting loose, the risk for me is related to focus. I find it much harder to focus on a subject accurately when shooting loose. One of my most pressure packed moments occurred last season as I shot the final pitch of Mark Buehrle’s perfect game while using my Nikon 70-200 2.8 VR. Although some might not consider shooting with a 70-200 loose, compared to working with the usual baseball focal lengths of 300 to 600mm, I think it is. With pitcher Mark Buehrle being the focal point of this image, you can see how easy it might have been to have accidentally picked up focus on shortstop Alexei Ramirez, who is just to the right of Buehrle in this frame. Accurate focus is always much more difficult to obtain when the subject is much smaller in the frame. Add to that equation an extra helping of nervousness due to the magnitude of the moment that was about to unfold, the pressure was magnified, making focusing even more difficult. In the end it all worked out, as the August 3, 2009 cover of Sports Illustrated will attest to. When shooting really tight the risk is, well, coming up with anything at all. For me, shooting tight is fun when the option to do so is available. I call it play time. It’s for those days when the assignment calls for “do your own thing”. Just messing around shooting tight behind home plate. 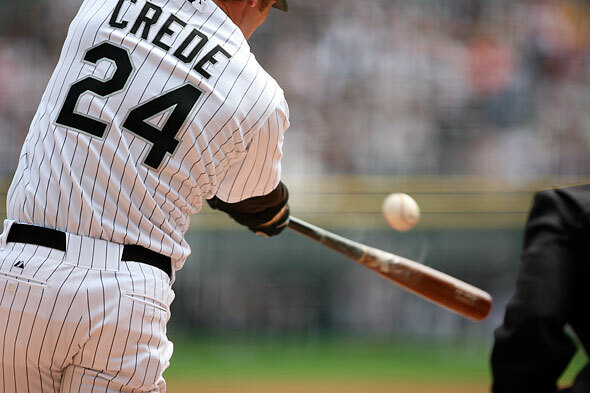 Joe Crede puts the bat on the ball, as he did often with the Chicago White Sox. On those days there is no pressure if the results aren’t there. But when that really tight shot works, it usually works well. The photo below was made a number of years ago back in Oakland during a boring A’s game and ended up becoming one of my best selling baseball images. If I had used any other lens other than a 600mm to make this image, the background would not have been as blurred and the visual impact of the ball landing in the catchers mitt lessened considerably. I made this frame with a manual focus 600mm lens on film, so there was no “chimping” to check my timing or get instant gratification. When cracking open a box of processed chromes back in the day, I called images like this a pleasant surprise! I was playing around, and it paid off. Another factor that comes into play when shooting extremely tight is the lack of depth of field. The longer the glass, the less depth of field there is. We’re talking inches here, and of course when shooting sports, movement is part of the game so the challenge when using such a lens is much greater. Using a shorter telephoto lens can help increase the depth of field, but I feel accurate focus combined with minimal of depth of field is part of the reward for taking the risk when shooting tight. Sometimes, it’s fun to shoot with a lens that usually isn’t usually considered normal for sports. Like using a 24-70. More of a scene setter focal length, as I used it here to make this image of the first pitch of the 2005 World Series between the White Sox and Astros. Everyone else concentrated on keying tight on the the pitcher. I wanted to set the scene and therefore shot much looser. I was rewarded with the double-truck World Series opening spread in the October 31, 2005 issue of Sports Illustrated. My favorite lens besides the array of telephoto lenses I use has always been the super-wide. Currently, that would be a 14-24 Nikon utilizing a full frame D3 or D3S camera body. When the opportunity to use it comes up, I don’t hesitate pulling it out of the bag. It’s a fun focal length to use. Why? Because it’s different. And then there is the wonderfully versatile Nikon 200-400 f4 zoom. What a great lens this is! Without a doubt, my MVL, or Most Valuable Lens. I have made more key images with this lens over the past few years than any other hands down. The ability to quickly adapt to changing scenes is a sports photographer’s dream. Case in point, check out the two images I made at the conclusion of last year’s World Series while on assignment for Major League Baseball Photos. 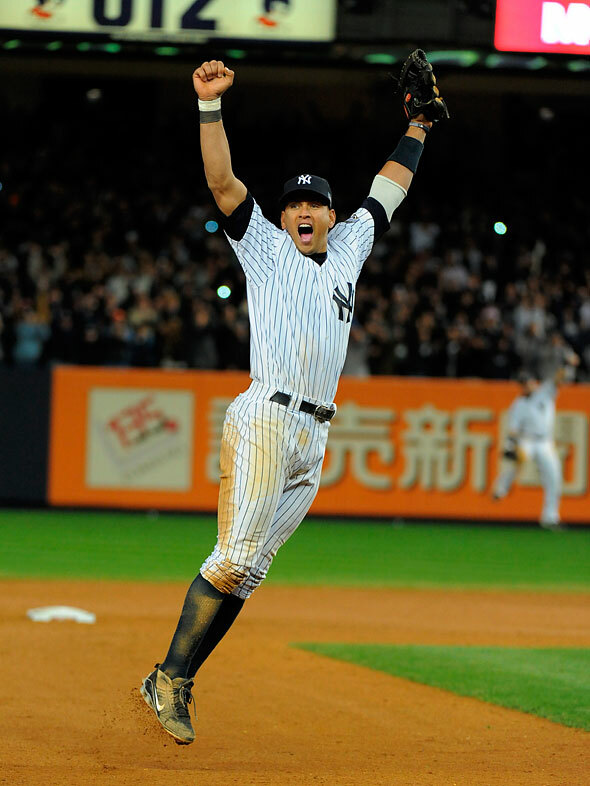 I decided to key on Alex Rodriguez for the final out since he had never won a World Series before. But I was positioned slightly behind Alex, and other photographers questioned my logic as everyone prepared for the impending celebration. However I knew Rodriguez’s then girl friend, Kate Hudson, was sitting just a few feet to my left, so I was sure he would turn towards her when the game ended. Bingo. Like clockwork, Alex spun in the air toward Kate and yours truly as the final out was recorded. For that frame, I was shooting at a focal length of 220mm. Then my attention quickly turned to the ensuing celebration beginning to unfold near the pitchers mound. Having the 200-400 provided me the ability to re-compose quickly in order to make the team celebration sequence at a focal length of 310mm. 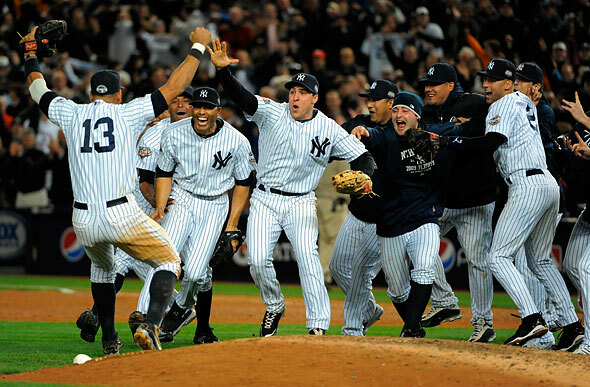 My images from this celebration ended up being used on the jacket cover of the 2009 World Series Official Commemorative DVD as well as the DVD release premier movie poster displayed in New York City. No way I make all of those images with one fixed focal length telephoto lens. Thank you, Nikon, for coming up with the 200-400! I have plenty of other samples to show the versatility of this lens, but this sequence is the most important to date. Mix it up, have fun and don’t be stuck on using one type of lens while shooting sports. At the very least, heading this advice will help keep both you and your images fresh. This entry was posted on Monday, June 28th, 2010 at 9:51 AM	and is filed under Sports Photography. You can follow any responses to this entry through the RSS 2.0 feed.